An archeologist working with Mowachaht/Muchalath First Nation (MMFN) elders and cultural observers at the Nootka Light Station over the past two summers has reached that conclusion based on findings at the site as well as documented historical evidence. Colleen Parsley of Aquilla Archeology found remains of a female adult and adolescent on the site of an old flower garden at Nootka Lightstation on San Rafael Island. Radiocarbon-dated to 1,000 years BP and determined to be of Mowachaht origin, the remains were distinctly different from archeological deposits found on the rest of San Rafael, Parsley said. All evidence pointed to the remains originating in nearby Yuquot village. A light station logbook and a 1985 history, Keepers of the Light by Donald Graham, refer to keepers transporting soil from Yuquot for a garden on the island, she noted. They either accidentally or willfully disturbed ancient grave sites to obtain the soil, she believes. More than an indictment of attitudes at the time, the findings present another example of callous disregard for Indigenous presence and thousands of years of occupation. Yuquot — which means “where the wind blows from many directions” — was not only a summer village and centre of the Mowachaht world but also point of First Contact with Europeans in northwest North America. Sediments date back more than 4,200 years. “This place, there’s layers and layers and layers of cultural narrative,” Parsley said. Aquilla was hired by the federal Department of Fisheries and Oceans/Canadian Coast Guard in 2017 to do the archeological work in order for light station upgrades to proceed. Subsurface tests last summer led to the first archeological documentation and recording of sites on San Raphael and at the Spanish fort site on neighbouring San Miguel. They found three cultural phases: Stone tools and fire-broken rock from the oldest pre-Contact Mowachaht; first archeological evidence of the Spanish fort during the Contact period (1789-1795); and the historic light keeping era. After the initial finding of remains this past summer, Aquilla consulted with MMFN. Elders directed the archeologists to salvage all transported deposits within the garden beds, which led to discovery of adolescent remains. The project also excavated artifacts such as shards of Mexican ceramic left by the Spanish, trade beads, pre-Contact stone pendants and bone artifacts related to harpooning and fishing. Their findings are surprising considering the site at San Rafael has undergone a century of what Parsley described as “benign neglect.” The small island is connected to and part of the larger village at Yuquot but has not been treated as such due to federal appropriation of the island at the turn of the last century. Yuquot/Friendly Cove was declared a national historic site in 1923 but was not officially recognized for its First Nations importance until 1997. Parsley, who has worked on a number of First Nation archeological sites on the West Coast, contends this neglect reflects colonial cultural bias and a preoccupation with early European settler activity. The islands now have limited federal protection, but they remain vulnerable, particularly with increased marine traffic in Friendly Cove. Visitors, “pot hunters” among them, have already removed untold artifacts through the years. “There’s a longstanding history of cultural theft that occurred at Yuquot and a lot more has to be done to stop it,” Parsley said. The current project is the first archeological work at Yuquot since 1966, when scientists working for the National Historic Parks and Sites Branch excavated village sites. The earlier excavations wouldn’t meet current standards and could not access the “bottom calibrated layer” of sediment, Parsley said. She emphasized the need for additional archeological conservation work at Yuquot as well as for proper legislation to safeguard sites, federal protections she maintains are long overdue. Dorothy Hunt, MMFN lands and economic development manager, said a traditional use committee is advising the MMFN Council of Chiefs on specific claims and title in relation to the islands. At the same time, the nation is pleased with the progress made in relation to the Coast Guard’s handling of the matter, suspending its upgrading project after remains were found, she said. 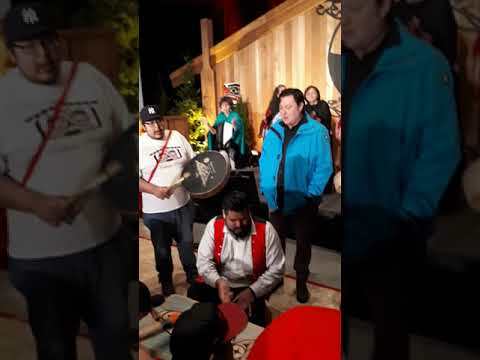 A blessing ceremony was held at the site last summer and arrangements are being made to rebury the ancestral remains sometime this fall in consultation with elders, Hunt said. MMFN is also working toward providing new staff from the community for the lighthouse and rescue station. “We’ve put out a call to members,” Hunt said. “We’ve had a fairly good response.” Four members have submitted their names so far, she added. The archeologist also sees benefits from the work at Yuquot.